DJIBOUTI, Djibouti, Feb 14, 2012 — U.S. service members transferred two anesthesia machines from Camp Lemonnier’s Expeditionary Medical Facility to Peltier General Hospital in Djibouti, Djibouti, February 6, 2012. The EMF upgraded their anesthesia capabilities, leaving the two machines as excess equipment. The excess machines were delivered to enhance Djiboutian medical care. “The hospital treats more than 2,000 emergency cases a year in five operating rooms; three which have the outdated machines,” Said stated. “Children will benefit from the equipment as the machines can be used in pediatric cases, unlike the older equipment,” he added. The outdated anesthesia machines can be unsafe for patients, U.S. Navy Lieutenant (Doctor) Heather Yurka said. She said the newly-acquired machines are also more modern and increase patient safety during surgery. 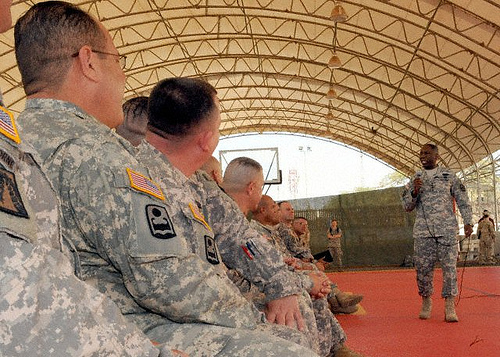 Djiboutian citizens aren’t the only ones who work and train at Peltier General. Djiboutian and American medical staffs often exchange medical professional knowledge there. Because of a 2008 cooperative agreement between Combined Joint Task Force – Horn of Africa and Peltier General Hospital, Camp Lemonnier Expeditionary Medical Facility personnel enjoy a working relationship with the hospital. Yurka stated that, under the agreement, she and EMF personnel exchange best practices with the hospital staff several times a week. Camp Lemonnier – U.S. Army Gen. William "Kip" Ward, Commander, U.S. Africa Command visited to send off the outgoing U.S. Navy core staff and speak with the 1st Battalion, 65th Infantry Regiment of the U.S. Army National Guard. Mogadishu – Islamic extremists shot the leader of an underground church to death outside the capital city of Somalia this month and have threatened to kill his wife, his tearful widow told Compass. Nairobi — Mogadishu residents have welcomed plans by the interim government to step up the integration of an earlier, ousted, regime’s security forces into its own army. Mogadishu – Deadly clashes have once again erupted across Somalia, claiming the lives of at least 37 people, as violence continues to prevail in the war-torn nation. An explosion near a base for the African Union peacekeeping force near the Mogadishu airport has left at least five people killed, including one soldier. The United States will join partners from more than 50 countries and international organizations at the United Nations in New York January 28 for a plenary meeting of the Contact Group on Piracy off the Coast of Somalia, a growing diplomatic effort that is making steady progress against criminals targeting Africa-bound humanitarian aid shipments and other vessels transiting one of the world’s busiest shipping corridors. Sexual violence has become a tool of modern warfare. Most victims are women of all ages, but often young girls; and the results are unwanted pregnancies, HIV infection and social stigmatization. Nairobi – The U.S. has suspended a five-year plan to fund Kenya’s education programs following allegations that more than $1 million in funds went missing at the Education Ministry. Kitale – Six Kenyans have been killed and over 2,000 villagers forced to flee home in Lokitaung district in attacks by Ethiopian militia, a Kenyan official said on Tuesday. Nairobi – Kenya on Tuesday called on the U.S. government to help mobilize international support for the transitional authority in Somalia. Nairobi – Thousands of flood-affected households still require assistance as ongoing rains in parts of Kenya continue to cause population displacement and destroy property and crops, according to humanitarian sources. Conakry – One of the fiercest critics of Guinea’s military ruler is now the country’s prime minister, marking another step toward civilian rule. Guinea’s military junta has named a civilian prime minister to steer the country towards elections but the troubled country’s future remains shrouded in uncertainty. Antananarivo – Madagascar’s embattled leader opened the door on Tuesday to the possibility of pushing back the date of widely criticised elections scheduled for March on the Indian Ocean island. United Nations – The United States is worried about the flow of arms into semi-autonomous southern Sudan, some of it heavy weapons, ahead of a nationwide April election, the U.S. envoy to the United Nations said on Tuesday. Khartoum – Sudan’s last elected prime minister said on Tuesday he would run for president in April’s elections, promising to settle the Darfur conflict and "dismantle totalitarianism" in Africa’s largest state. Moscow – Libya’s defence minister arrived in Moscow on Tuesday for talks that Russian media said could result in a $2bn defence contract including 20 jets. Lagos – Gunmen shot dead a prominent opposition politician in Nigeria’s south western Ogun State amid rising tensions ahead of general elections next year, police said on Tuesday. Washington, DC – Secretary of State Hillary Clinton says the Nigerian man who tried to set off a bomb on a US airliner December 25 may have been driven to embrace Islamic radicalism by poor governance and corruption in that country. Port Harcourt – A coalition of former Nigerian militants and Niger Delta community leaders rejected on Monday government efforts to reintegrate thousands of ex-rebels, saying training centres and funding were inadequate. A former rebel leader of the defunct Independent National Patriotic Front of Liberia (INPFL) turned politician, Prince Y. Johnson has declared his intention to contest the 2011 Liberian presidential elections. The United States Ambassador to Liberia, Linda Thomas Greenfield, will on Wednesday, January 27, sign grant agreements to provide assistance to several community groups from across Liberia. The U.S. Navy on Tuesday released the final terms for a multibillion-dollar competition between General Dynamics Corp (GD.N) and Lockheed Martin Corp (LMT.N) to design a new class of coastal warships.